We get a lot of frequently asked questions about the Piggyback Rider standing child carrier. It's a unique backpack for carrying kids, toddlers ideally, unlike anything anyone has seen. We have provided answers to our most common frequently asked questions about child carrying and the Piggyback Rider. If you have a question that hasn't been answered, please email us here. Click here to print. What is the weight limit for a child on the Piggyback Rider®? The Piggyback Rider® has a weight capacity of 50 lbs. / 23 kg. What is the suggested age use for a child on the Piggyback Rider®? The Piggyback Rider® is ideal for children 2+ yrs. Although all children are different sizes we recommend an upper limit of 6 years old. If your child can walk up and down stairs unaided, then your child is ready for the Piggyback Rider®. Is a safety harness included with the carrier? Yes. Every Piggyback Rider® carrier includes a Safety Harness. There are 2 options, both work the same way, just pick which one is best for you. Can the HIP Belt be adjusted? At this time the HIP Belt can only be used in the one position. For many years we delivered the Piggyback Rider without a hip or waste belt and don't see it as a necessary item, but more of a personal choice. Some customers over the years asked for more distribution onto the hips and we created this first version. One of the downsides to the HIP Belt is that the bar cannot be raised and lowered based on the height of the child. We are always in development and hope to be able to fix this concern in the future. What if the child’s foot slips off the bar? The Piggyback Rider is equipped with a child harness to ensure the safety of your child at all times. We recommend that children wear shoes while riding the Piggyback Rider®, which allows for a better grip on the bar grip tape. If a child lifts one foot, this shift in weight will immediately be noticed by the adult, who can help reset the child’s foot on to the bar. If one foot suddenly slips off the bar (a very rare occurrence), assist the child to put it back on. The child harness (secured around the child’s back and under the arms) will support the child in the event that both feet slip off at the same time. In all circumstances where the foot may slip, the child typically continues to hold the child hand holds or the adult’s shoulders. What happens if the child lets go of the handles? If a child lets go of both handles, they will be secured to the Piggyback Rider® by the safety harness and their legs. Does the Piggyback Rider® meet consumer product safety regulations? The Piggyback Rider® has met or exceeded all required consumer product regulations for the USA, Canada, EU, Australia and New Zealand. Have you won any awards for your innovative design? Yes we have. Thanks for asking. Why doesn’t the child harness have a chest strap also? The child’s harness is specifically designed without a chest strap to avoid strangulation when mounting, dismounting or in the event of a fall. Does the bar put pressure on the adult’s back when in use? No. The child’s weight pushes the bar straight down (towards the ground) rather than at an angle into the adult’s back. In addition, the bar remains against the adult; it does not repeatedly bump the adult allowing for a comfortable ride. How hard is it to learn to use the Piggyback Rider®? It’s very easy and natural. We recommend a few minutes in a controlled environment for the first time use and both carrier and rider will be comfortable. Do you need two people to mount and secure a child on the Piggyback Rider®? No. It is designed that the adult can either kneel down or sit on a chair to let the child up on the bar. Then either the adult or child can clip in for safety depending on the age of the child. How does a child get on/off the Piggyback Rider®? We recommend an easy four-step process to mount the Piggyback Rider®: 1. Secure child harness, 2. Connect child harness to carrier, 3. Squat down and allow child to mount the bar, 4. Stand up slowly. For dismount, follow the steps in reverse. We have several videos on our website to aid the first-time user. See our animations on the product pages. Is the Piggyback Rider® available in other colors? Currently the Piggyback Rider® is available in grey/orange and grey/black. How much does the Piggyback Rider® weigh? What are the key safety features of the Piggyback Rider®? The Piggyback Rider® is engineered for safety and we require that every Piggyback Rider® is manufactured to meet our extremely high quality standards. All materials are the highest grade climbing buckles and polypropylene webbing. At key construction sites, the webbing is stitched in two locations and bar-tacked for additional reinforcement through several layers of material. The child harness is box-stitched for added strength. The aluminum bar is tempered for additional strength. It is Dad-invented but also Mom-approved for safety! Is the Piggyback Rider® made for women (moms)? Yes, absolutely. 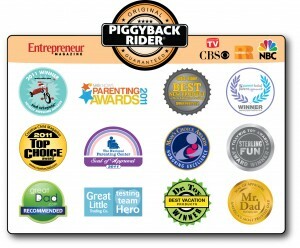 The Piggyback Rider® is a unisex design, appealing to moms, dads, grandparents, boys and girls. Where do you use the Piggyback Rider®? The Piggyback Rider® is ideal for walking, hiking, shopping, parades, zoo, amusement parks, and anywhere else your child may tire before the end of the adventure. Can I carry two kids on the Piggyback Rider®? No. The Piggyback Rider® is designed to carry one child at a time. How big is the Piggyback Rider® when not in use? When not in use, the Piggyback Rider® is approximately the size of a rolled bath towel. How do I register my Piggyback Rider®? Can I exercise with the Piggyback Rider®? The Piggyback Rider® should not be used while running, but is ideal for long walks where you can burn up to 359 calories per hour. Calculate the calories burned per hour here: https://www.caloriesperhour.com/index_burn.php. Just add the weight of your child to your body weight. Will the Piggyback Rider® help my posture? The Piggyback Rider® is not a medical device. However, the Piggyback Rider® allows the weight of your child to be distributed along your hips instead of on your shoulders. This eliminates the dreaded piggyback hunch we all are familiar with. Instead of having to slouch in order to keep your balance or your child on your back, with the Piggyback Rider® you will be walking in a natural upright posture, engaging your core muscles. What happens if a child tries to jump off? To jump off the bar, the child would have to push down with their arms, and hold their body weight up on the carrier. If they succeeded, the adult would instinctively guard the child by guiding them to the ground. In addition, the child harness would catch them. We suggest developing a communication strategy with your child to discuss when to get on and when to get off the Piggyback Rider®. You may purchase merchandise from this Website by using any one of the payment options listed below. Full Sail International, LLC reserves the right to change its payment procedures at any time without prior notice to you. All products being returned require a Return Authorization number. Service under our warranty is available to the original purchaser by contacting customer service at info@piggybackrider.com for a Return Authorization number. We will accept returns within 30 days from purchase, BUYER must cover return shipping cost. If you have any problems with your Piggyback Rider, please contact us before leaving feedback and we will help to correct the situation. Returns: We assess a $10 return / inspection / cleaning fee for all Carrier sets returned that have been opened and used. For a full refund, BUYER must return items in good and re-sellable condition with original packaging. Customer damaged merchandise cannot be returned. Upon receipt of the product, we will inspect it and a refund or replacement will be approved within 5 business days. If the item is found to be defective, we will replace it at no additional cost. All returns must be accompanied by an RMA (which will include the RMA# and Ship to Address) from us. Make sure your return is clearly marked with your name and RMA # so returns can easily be identified. Obtain a Return Authorization – All returns require prior authorization from Full Sail International, LLC. To obtain a Return Merchandise Authorization (RMA) number email info@piggybackrider.com with the invoice number from your order and the reason for your return. If you do not include an RMA number on your return slip, we cannot process your request. Please repack the merchandise you are returning in the original shipping box or a similar box, include an email print out of your RMA and mail to Full Sail International, LLC at the address listed on the RMA. We recommend returns be shipped via UPS or insured United States Postal Service for your protection. Full Sail International, LLC is not responsible for items lost during shipping. Returns without an RMA cannot be processed. Refunds for merchandise will be issued only to the billing name and address on the original order.